Since 2nd December 2014, Sankara Hotel in Westlands has turned its second floor into a gallery to exhibit art from One Off. Once the space is truly established, more art will appear in other areas of the hotel including the Champagne bar on the rooftop. Sankara has positioned itself in the market as being the only 'art hotel' in Kenya. It aims to portray an image of understated urban chic with an insider's knowledge of the best art in the region. 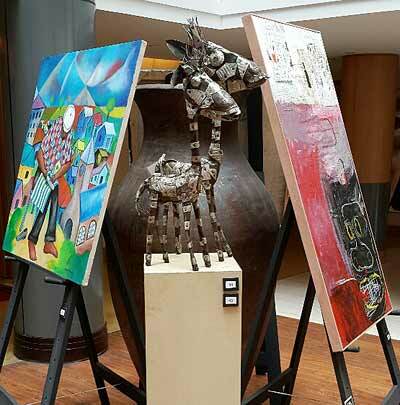 The Hotel already owns one of the biggest permanent collections of Kenyan art in the country. Curated by Marc Van Rampelberg, Sankara displays original works by Jackson Wanjau, Chelenge Van Rampelberg, Morris Foit, Yony Wai-te, Kivuthi Mbuno, Fitsum Berhe, Timothy Brooke, Elijah Ooko, Patrick Mukabi and Sane Wadu to name but few. Anyone interested to see more works from these artists would be much welcomed at the One Off Gallery at #16 Rosslyn Lone Tree. To purchase an original artwork from the Sankara Gallery space on 2nd floor please proceed to the Boutique on the 1st floor. With some warning, paintings can be removed from their stretchers and rolled. Sculptures can be crated. Many people choose to travel with their purchases but if this is not a possibility, One Off partners with DHL couriers who are extremely experienced at handling our art and will deliver your purchases to your door. Quotations for this additional service are available on application.